We believe it is safe to say that this has been the most boring Primary Election Day in the last several years. As a result, we’ve been reading the blogs more than usual and noticed that Paul Ogden wrote a post on the Primary Election and the expectations game he feels we are playing on our blog. On the Primary Election, Ogden said the Kennedy and Ballard campaigns have not followed textbook campaign strategy and are not using the window of opportunity before the primary election to build up positives on their candidates. First, we’d like to see Ogden’s Textbook of Political Strategy published. Second, we have a split opinion. We have written that we are surprised the Kennedy campaign was not more aggressive. We thought they should make sure they won the primary with a overwhelming margin. They really did not have much of a grassroots effort–their yard signs didn’t even arrive until last week. They did not do a large amount of mailers though we won’t say they didn’t do ANY since we would not be on their list anyway. They did not put out a television ad. This is particularly interesting since a candidate running At-Large against the Democrat slate was able to do a cable ad while Kennedy sat silent. Really, the only thing the Kennedy campaign has done is send emails, conduct a city tour and put up a radio ad with Andre Carson. We don’t think they really took this primary campaign seriously. As for the Ballard campaign, we aren’t really sure why they would do a great deal for the primary. 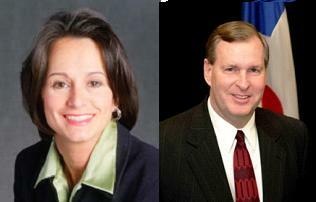 Kennedy is facing two opponents while Ballard is unopposed. Ballard won the primary when the filing closed. It makes sense that the Ballard campaign would do far less than the Kennedy campaign and save their resources. As for the expectations games, we’d say Ogden is the pot calling the kettle black. Paul is trying to help out the Kennedy campaign by lowering expectations. The fact is that if Melina Kennedy gets 60% of the vote as Paul predicts, 40% of the voters in the Democratic Primary voted against her. Like it or not, that is not a strong showing in a Primary where your opponents have no money and no real campaign effort. The fact that they couldn’t clear the field for a candidate that raised nearly $1 million last year shows there is a problem. And the fact that both of these candidates are African-Americans indicates there could be a divide in the Democratic Party in a very key constituency. The bottom line: A 60-40 win is not a mandate in a primary election. The Star will label it an overwhelming victory for the Mayor that propels him toward the fall general election as the Mayor trounces an unknown opponent 71% to 29%. Political professionals though will know that an unknown getting nearly 30% of the primary vote against a sitting mayor represents a deterioration of his political base. As you all know, there was no primary opponent for Mayor Greg Ballard. And, now it is apparently okay to have more than 40% of the primary vote against the slated candidate who is the clear nominee and has run for countywide office in the past. Like we said, we’re really looking forward to Ogden’s book on political strategy. Kennedy is not an incumbent. Ballard is. Yes, a single opponent getting 30% agaisnt an incumbent Mayor is a sign of a problem. I’ve actually attend been to campaign school and taught campaign strategy. How about you? Running ads to build positive name ID during a primary window is Campaign Strategy 101. Are you disputing that strategy? Both Kennedy and Ballard failed to execue that basic campaign strategy. Melina is saving her money to run against you guys! Robert, I thought that you were great on TV tonight.